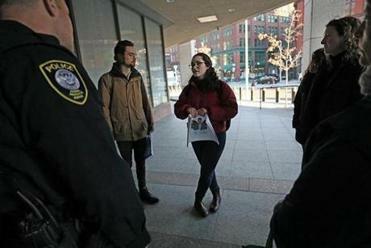 Bar Kolodny, a friend of Eduardo Samaniego, took a petition seeking his release to the ICE offices in downtown Boston on Wednesday. If you want to understand how completely arbitrary and capricious our broken immigration system is, consider the case of Eduardo Samaniego. Ten years ago, when he was 16, Samaniego left Mexico and moved to Kennesaw, Ga., where a pastor took him in. He hit the books, made the honor roll, and graduated from high school as student body president. He wanted to go to college, but his undocumented status left him unable to apply to most schools in Georgia. He began advocating for undocumented immigrants to have access to higher education. Hampshire College in Amherst caught wind of his story and offered him a scholarship. He thrived at Hampshire, and continued to dive deeper into activism, because he wanted more immigrants to have the opportunities he had had; he also wanted, badly, to legalize his own status. He became known and admired by ordinary people and influential people, including Senators Ed Markey and Elizabeth Warren. Jim McGovern, the congressman from Worcester, was moved by Samaniego’s life story when they appeared at a rally together. Samaniego’s rise from obscure high school student to celebrated immigration rights activist was not without setbacks. A few years ago, he was visiting friends in Georgia when a gas explosion at the apartment where he was staying left him with burns over half his body. He recovered enough to return to school, but there were lasting injuries. 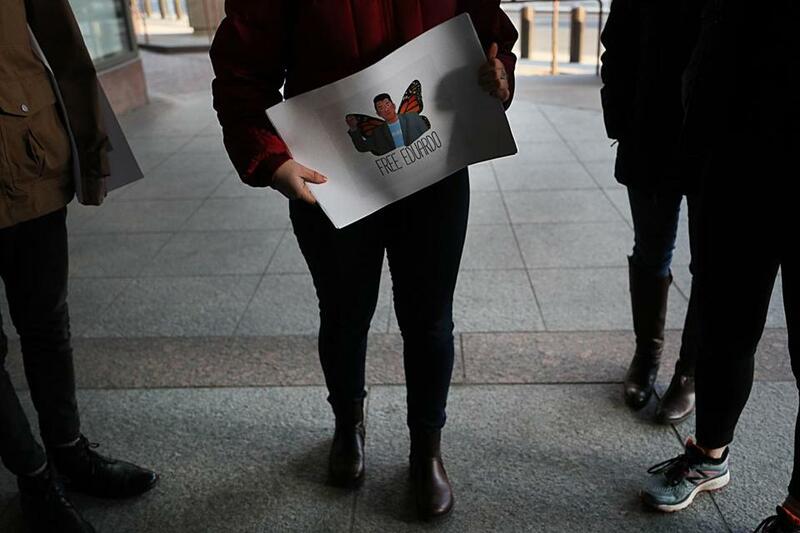 Community groups organized a petition and a vigil in Boston on behalf of Eduardo Samaniego, 26, an undocumented immigrant who attended Hampshire College. “There was definitely some post-traumatic stress,” said Charles Kuck, an Atlanta lawyer who became one of Samaniego’s advocates. That stress may have been at the root of the almost absurd circumstances that find Samaniego locked up, facing deportation. Kuck said Samaniego was having difficulty concentrating at Hampshire, so he took a break last semester. He was back in Georgia in October and went for a run. “He got lost,” Kuck said. He flagged down a taxi and tried to find his way back to where he was staying, but he couldn’t and in the process ran up a $27.75 fare. Samaniego didn’t have any money on him, so the driver called the cops. It was a minor infraction and should have been resolved with Samaniego contacting friends and settling the unpaid tab. But unlike in Massachusetts, law enforcement agencies in Georgia routinely turn suspected undocumented immigrants over to Immigration and Customs Enforcement. That kind of cooperation is supposed to prioritize hard-core criminals, not college students who can’t pay a cab fare. But it’s different in Georgia. Samaniego found himself in front of a Trump-appointed immigration judge who refused him bail. Kuck said Samaniego’s mental health has deteriorated since he was taken into custody. This week he was transferred from a Georgia lockup to a for-profit detention facility in South Carolina with medical facilities. Rose Bookbinder, who worked with Samaniego at the Pioneer Valley Workers Center in Northampton, said there is a multistate support network advocating for Samaniego’s release on bail so he can return to Massachusetts and get the medical care he needs. On Wednesday, there were rallies for him in 11 cities. Samaniego’s supporters believe he has been targeted for his activism. That’s a good question, one I wanted to ask ICE, but, with the government shutdown, its people aren’t taking calls. Kuck said Samaniego loves and appreciates the United States deeply. The prosecutor dropped the theft charges against Samaniego after he paid the taxi fare. ICE does not appear inclined to anything so reasonable. Samaniego sent a message to his supporters, asking them to keep fighting.